Bar staff / bouncers can be idiotts to put it nicely! Apart from that, can be a good place to bob into on night out for a couple while passing. Loads of live sport, and not just football which is good given Sale having the best rugby team in the UK(yes i know they play in Stockport). Staff are friendly,warm and welcoming. Atmosphere is good and management have worked hard to get of all the scum of Sale. Some still get through but you cant expect miracles given the way Sale is!!! 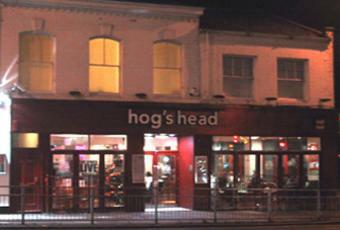 Everything is relative - as far as pubs in Sale goes the 'Hog Shed' is practically Eutopian when compared to the Met Bar and the Waterside. The pub does get busy and it can take a while to get served, however, table service is very good. It does attract a few idiots, but on the whole it's quite friendly, relaxed and comfortable. If you are looking for table football, search elsewhere, as the table here needs more than just TLC, it's barely playable. The pool table's OK, considering the number of pints that no doubt get spilled on it each week. This pub is the HQ for Sunday football league side AFC Sale Moor. The bar staff seem to have developed an unhealthy interest in these players and it is rumoured most of the team have had more than a drink off them. Drinks are expensive but the table service is top notch. However crisps are ridiculous at 70p per pack. A disgrace to the crisp industry. It isnt as good as it was when it first opened. It attracs the wrong crowd yet thereisnt always trouble but you have to assume there could be! Prices are ridiculous! and there is a funny smell. staff are slow and dont know who they are supposed to serve next - i waited 20mins to get served then eft because i couldnt be ar5ed anymore!